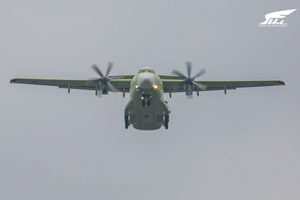 Light military transport aircraft IL-112V made its first flight from the aerodrome of the aircraft building enterprise PJSC "VASO" (part of the Division of transport aviation of PJSC "UAC"). The first prototype of the IL-112V, built under a contract with the Ministry of Defense of the Russian Federation, lifted into the air on March 30. The crew was commanded by Nikolai Kuimov – the chief pilot of PJSC "IL", Hero of Russia. The IL-112V was accompanied by an IL-114LL laboratory aircraft in the air. The flight was in normal mode. It was preceded by a cycle of airfield operations, during which all systems were tested, rolling out, including a partial separation from the ground, was performed on the airfield, and a conclusion on the readiness of the aircraft for the flight tests was obtained. On the ground, the test pilots were met by Yuri Borisov, the Deputy Chairman of the Russian Government, the heads of the Ministry of Defense of the Russian Federation, the Ministry of Industry and Trade of the Russian Federation, PJSC "UAC", PJSC "IL", PJSC "VASO". In the future, the Il-112V can replace not only the An-26, which it exceeds twice in transport efficiency, but will also compete with the best world transport aircraft of the same class. Source: PJSC “Ilyushin Aviation Complex”.